We just got back from Gran Canaria and I still can't believe we managed to travel there. Last year we bought our flat and finished decorating it a few months ago. Needless to say, now our budget is tight and we need to build up our financial reserve from 0. Bartosz has his investment & saving excel spreadsheets (they look so complicated I get dizzy even thinking about them) and according to them, we should have been able to travel in a 4 months time, starting from the middle of February 2018. Shortly speaking, no vacations for a year, just some quick weekend/1-day trips from time to time. I'd wither like a petunia on Chihuahua desert ; especially that we'd already had to tighten our belts before we moved in. I know this isn't a life disaster, but for someone hooked up on travel, someone who gets energy, inspiration, and happiness from traveling, this is a problem which effectively decreases life quality. 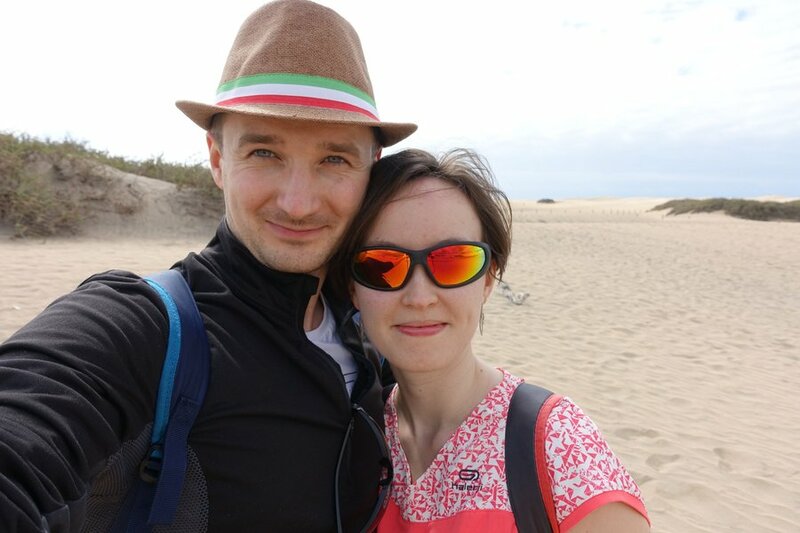 Since there are many reasons to visit Spain , Bartosz made some adjustments to his financial calculations, we squeezed this and that, and off we went to Gran Canaria to breathe in some fresh air, rest from freezing cold, get much needed sunlight, and recharge our batteries. And I know this is the best investment we could possibly make at this moment . Traveling makes us more self-confident. After holidays we remarkably increase our productivity. Contact with different culture and surprising reality of new places broadens our mental horizons and improves our creativity. I have now twice as many ideas for blog posts than I had before vacations. Besides, we're just happier and smile more. It's always the same story: after getting back from vacations our enthusiasm for work is doubled . We think more clearly and are definitely more efficient. So, refuelling our energy every now and then is crucial for us to function well. If you think that you can't afford to travel at the moment, but really would like to get away from your everyday routine, read about these realistic steps you can take to save up money for vacations. As usual, our one-week holidays did us wonders - we returned relaxed and suntanned (we successfully produced much needed vitamin D). We're now fully motivated and got back to work firing on all cylinders. I truly recommend everyone to get away to some nice, sunny place during winter time. Especially us Poles need to break free from our cold country in winter - days are short, sun is a rare anomaly and, unfortunately, the air quality is very low as lots of houses still use coal stoves. Actually, in winter time Poland has the highest air pollution level in whole EU . I just wonder when Poles will stop choking on air in winter time (I do believe the positive change is coming, I just don't know how many years we would need to wait for it). Anyway, sunny escape from freezing cold in your country is the best idea ever , it makes much more sense than traveling in the summer when day is long, sun shines like mad and trees have beautiful green leaves. Plus, the energy boost is much more significant after winter vacations than in the summer. Travels provide us with interesting subjects to talk about with other people - we always have some interesting stories to tell, can share experiences with other travelers. It can save a meeting which at the beginning was going to be soooo boooring. It's true that traveling firstly take your breath away, only to make you a great storyteller afterwards. Traveling makes us more independent and self-confident. Visiting foreign countries, contact with different cultures and unknown habits, organizing things in foreign language - it all creates our self-reliance and provides us with valuable knowledge and priceless experience. It does help us to cope with problems in our everyday life. When traveling with friends and/or family, we become closer - shared experiences solidify our relationships. During travels it's easier to find inner peace - we don't need to work and hurry, we observe other people more willingly and usually have more contact with nature. We forget about chasing after material goods and focus more on present moment and the experience. "All we have is now" seems to be much easier to remember when traveling . Memories from vacations lift our spirits on a dull day - all those adventures, unforgettable landscapes, unplanned moments out of our comfort zone cheer us up long after the travel ends. So, it's currently -10°C outside in Gliwice right now but we don't mind. We're rested and motivated to work hard again because we just got back from wonderfully warm and sunny island. We just couldn't afford not to go. By the way, we stayed in Maspalomas - lively tourist resort in the south of Gran Canaria. It's especially famous for its Dunas de Maspalomas - vast area of sand dunes. The majority of hotels in Maspalomas are located close to the beach. How about you, do you know anyone who regrets spending money on travel?